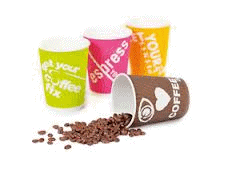 Single Wall Coffee Cups - Coffee Cups Online has a selection of 3 styles of Single Wall Coffee Cups, available in 4oz, 6oz, 8oz, 12oz & 16oz. Plain White - An uncoated white matt board, so this is perfect for stamping your logo. Matt Black - Also an uncoated matt board. Black with Swirl - Our unique swirl design offers something different from your plain cups. Plus choose from our range of quality lids, available in Black & White, Flat or Sipper (spout), or Biodegradable for the ECO conscious. Click 'Single Wall Coffee Cups' to ORDER ONLINE NOW!